Scientists at the Fraunhofer Institute for Mechanics of Materials IWM in Freiburg and their partners in the RemBob project are working on coating plowshares with diamond-like carbon (DLC) to reduce friction. When it comes to moving earth, a significant amount of energy is used in food production, fuel production and construction. Less friction equals less power needing less fuel. The plowshares coated with diamond-like carbon slide through the soil “like a hot knife through butter”. As a result, the tractors pulling them need less power and fuel. In some tests the power required has been reduced by more than 30 percent. This is a significant reduction: across farming and construction worldwide it would really add up. Diamond Like Coating On Soil Tool. Click image for more info. Extremely hard, diamond-like carbon coatings are already being used to protect hard disks in computers and ensure that sliding bearings remain smooth. Fraunhofer, using German agriculture as an example, anticipates that in the future they could help farmers to save fuel while plowing and make it easier to till the ground. Farmers in Germany consume nearly a billion liters of fuel every year to work their land. Around 50 percent of the energy used when plowing or harrowing is consumed as a result of friction between the plowshare and the soil. Fraunhofer scientists have already been able to reduce friction by half. The power required by the tractor has also been reduced, by more than 30 per cent in some tests. For farmers a smoothly cutting soil tool means either a time gain because they can use wider equipment covering more area or lower costs for fuel, machinery and maintenance. The tractors can be smaller or can operate in partial load, with longer repair and maintenance intervals. Physicist and trained fruit farmer Martin Hörner from Fraunhofer IWM explains, “From the environmental point of view it would be better for the tractors to be smaller.” They would not only need less fuel but would also be lighter. Lighter machines mean less soil compaction, and the looser the soil; the less power is needed to work it. The quality of the soil would also be better. In highly compacted ground there are hardly any worms and other small creatures, which help to turn the soil and enrich it with nutrients. Compacted soils are less able to absorb water and dry out more quickly. “In Germany we are relatively advanced as far as protecting soil resources is concerned, but even in this country more soil is lost by compaction and erosion than is created by natural processes,” explains Hörner. The loss of quality soil is a serious worldwide problem. A further advantage of DLC coatings on soil working and tillage equipment is the protection they provide against corrosion and wear. Soil tools have to be hard and sturdy but also resilient, so that they do not break if they hit a rock. High-durability steels are used, but they suffer visibly if they are used for a prolonged length of time in the soil. “A blade on a circular harrow can lose 50 per cent of its mass through wear every season,” states Hörner. Soil, sand and stones wear down conventional coatings within a very short time. That explains why soil tools have not been coated up to now. The new DLC coatings, however, can withstand the extreme stresses and strains. 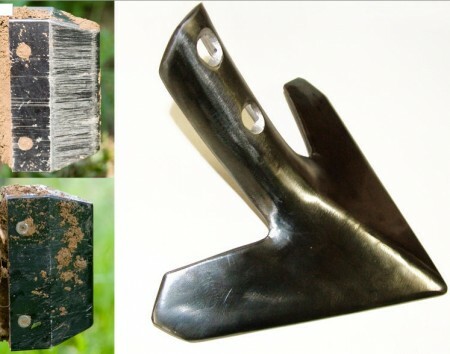 The problem remaining is that the tough steel foundation of soil tool equipment deforms too easily and is therefore unsuitable as a substrate for the much more rigid diamond-like coating – it would quickly spall. So the project partners are testing soil tools made of different materials, including nitriding steel, glass-fiber-reinforced plastic and tungsten carbide out in the field. The next project goal is to plow at least 20 kilometers of ground before the coating fails. “If we achieve that, wear-free soil tools will be within touching distance,” asserts Hörner. Your humble writer isn’t familiar with the farming conditions in Germany. Across the planet soil will have basalt, granite and other very hard sands, clays, loams and rocks. The abrasives in soils are going to present quite a problem. Farming in the U.S., essentially fully mechanized, operates at ground speeds of 4 to 7 miler per hour. That puts the 20 kilometer stage at about two hours of operating time. This won’t be enough, by more than an order of magnitude. A 10-hour working day could be 50 or 60 miles or about 100 kilometers. The DLC looks like a great development. The research is at the lab stage with impressive results. Going commercial is going to require the coating to stay on the tool far longer than the scientists seem to expect. Food production is very timing sensitive for planting, nurture and harvesting. Switching out tools several times a day won’t work. But get that coating to last, save gallons of diesel per hour, and the fuel cost for food and biofuel production could plummet. It’s worth the work. Lets hope the team stays on course and brings the market a low cost highly efficient soil tool solution soon. Hörner’s contact info is on the Fraunhofer press page. I wonder how this compares to no-till farming. I’ve heard that one problem with no-till is increased herbicide use that is effectively trading one downside for another. Brian I saw this article and thought of you. I wonder how John Deere would feel about a diamond tipped plow? When he introduced the first case steel plow in the 1930’s – it opened up the American plains for farming. Meanwhile – in the lab we are seeing material scientist attempting to grow diamonds the size of bricks for use in the semi-conductor industry. If they are successful, can we expect to see a genuine diamond tip on the plow of the future? Correction – I meant the 1830’s. John Deere introduced his plow in 1830.